As the saying goes, out with the old and in with the new. That is, unless you’re Toyota. It seems one of the largest automakers in the world is dragging its feet when it comes to updating their half-tonne offering. 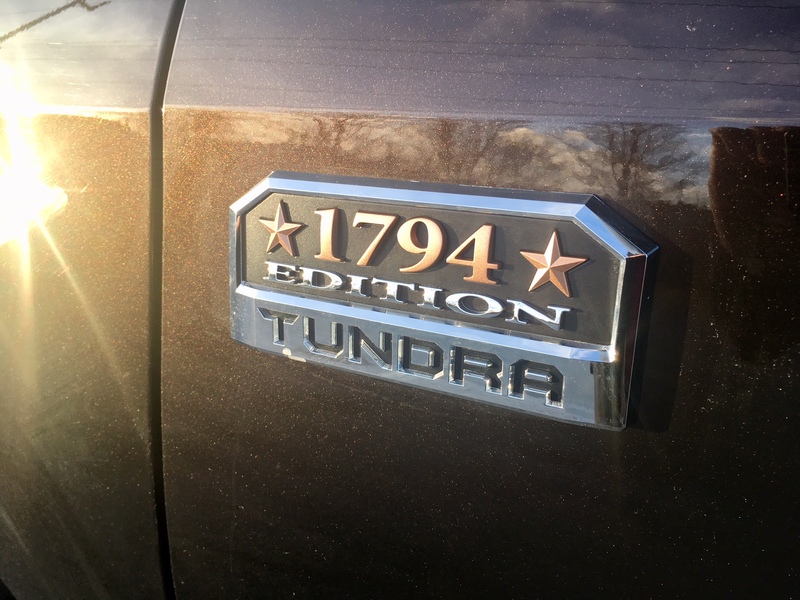 The current Tundra has not been significantly re-worked since the 2007 model year. Sure, in 2014 they came up with a brand new design, but changes were largely cosmetic. And so here I am in 2018, expected to review new vehicles, essentially reviewing an 11 year old truck. But before you go on a judgmental tangent, being one of the oldest trucks on the market today does indeed have its advantages, believe it or not. 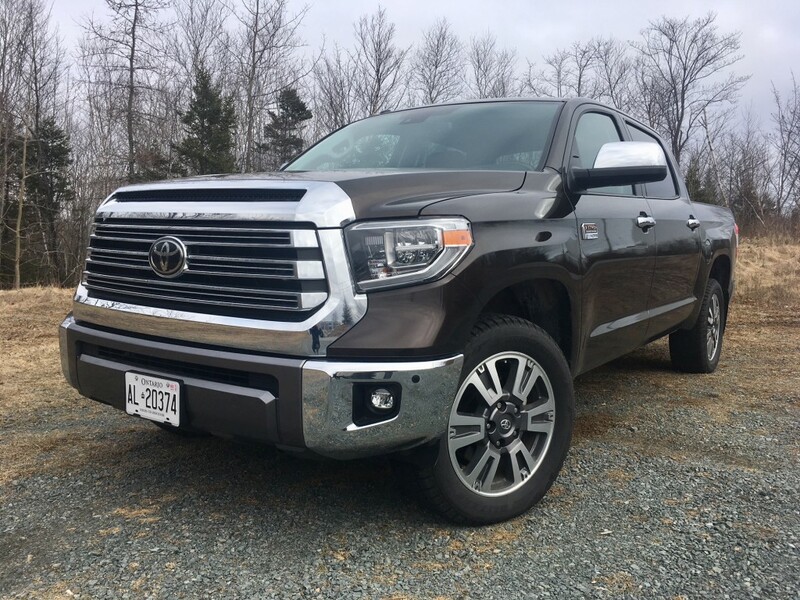 2018 may not be the year Toyota decided to give the Tundra a full-make over, but it did make a couple of changes. 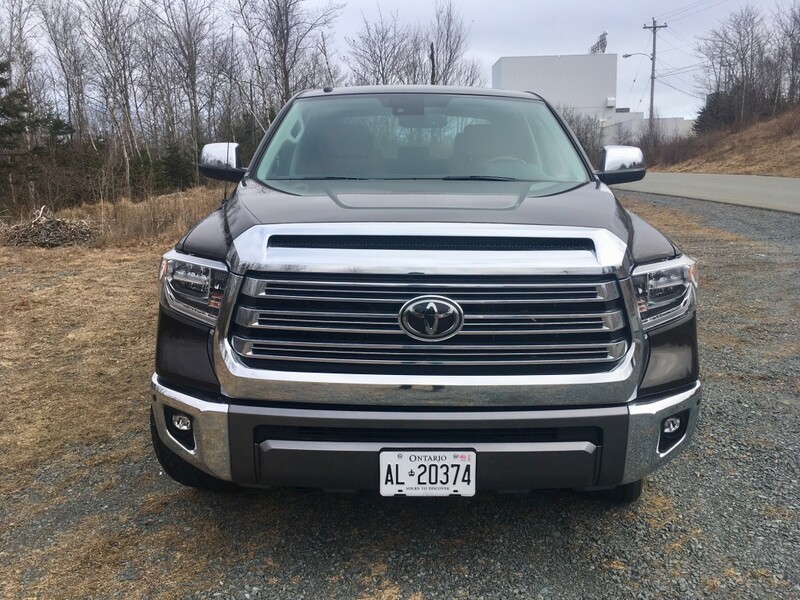 Firstly, all 2018 model year Tundras get redesigned LED daytime running lights as standard, and upper trims now get much needed LED headlights with matching fog lights. That’s about it in terms of updated visual cues, but if you look closely at the large emblem at front, you’ll notice a radar housed inside. This is a part of Toyota’s safety sense system, available on most 2018 Toyotas. The system includes many different collision methods including front collision warning with pedestrian detection, lane departure warning, automatic high beams and adaptive cruise control. This system is available on everything from the base Tundra to my fully loaded 1794 Edition and is much welcomed. However, during a long-distance trip, I found the adaptive cruise control made itself unavailable more often than not saying the radar could not be used because it was blocked. I pulled over figuring some ice had lodged itself in there, but there was no blockage to be found. I wiped away some dust from the radar and hopped back in to try again. The adaptive cruise control still would not work. I pulled over again some ways down the road, turned the Tundra off then back on again, and voila. Suddenly the system was available. This happened about two or three times during my time with the Tundra, and aside from being inconvenient, it also prevented me from getting some increased fuel mileage benefit by using the cruise control. And trust me, the Tundra can take any help it can get in the fuel savings department, which I will get to momentarily. Getting into the tall Tundra proved difficult almost every single time. Not only did my tester not come with running boards, but they aren’t even available as an option. The only way to get one is to have them installed as an accessory by your local dealer. Once you do awkwardly throw your body inside, you’ll notice the interior is quite swanky. The 1794 edition adds woodgrain and leather wrapped steering wheel, premium leather seating with suede accents (in an eye-catching caramel colour) and a woodgrain and leather wrapped shift knob. Toyota says the 1794 edition gets you unique 20-inch wheels too, but they are the exact same wheels as on the Platinum Edition. The colour of the leather seemed to please most who sat in it, but otherwise the interior looks dated. The infotainment screen is small by today’s standards and the painted silver trim looks old as well. Even in the top trim, you don’t get push button start and keyless entry, though Toyota will be quick to point out that they’ve at least integrated the lock and unlock buttons onto the key fob itself for 2018. 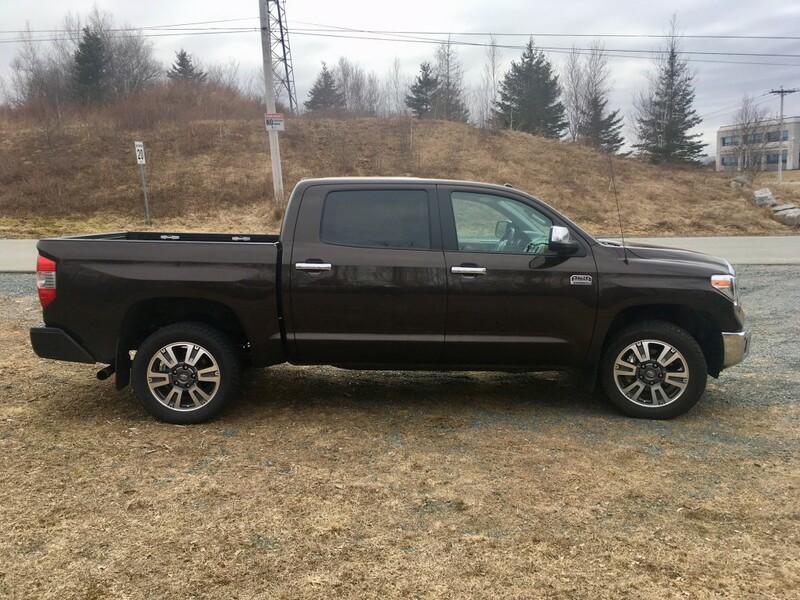 Happily quality is at least where it should be at this price point and the Tundra still offers as much space as any of its direct competition. Rear seat legroom is positively limo-like, for instance. The infotainment system works well and responds to commands relatively quickly and the system itself is straight forward and easy to use. 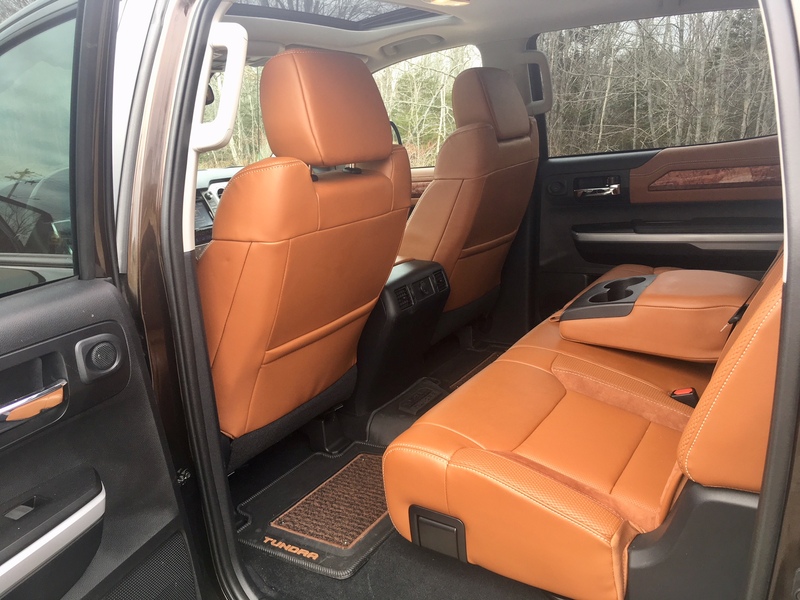 Despite being one of the oldest trucks on the market, the Tundra still comes with a class exclusive feature. Higher trims get the ability to roll down the entire rear windshield giving rear passengers as taste of a convertible-like experience, or to accommodate longer items. I’m not sure why other manufactures have yet to copy this feature, but it’s certainly their loss. Power comes from a down-to-earth- regularly aspirated 5.7 litre V8 which will net you 381 horsepower and 400 pound feet of torque mated to a six-speed automatic. This engine roars to life the same way an awoken bear would. The growl does a good job of getting the driver’s testosterone levels going, but it is the only engine option available at a time when other manufacturers are turbocharging, downsizing displacement, offering cylinder de-activation and even adding diesel options. 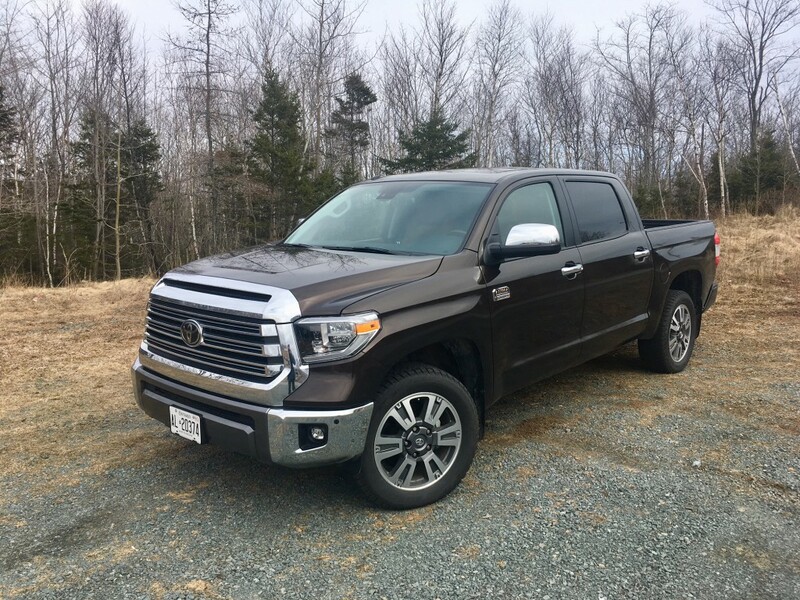 U.S. spec Tundras can be had with a 4.6 litre V8 but not for us Canadians. Even though the competition seems to be doing a lot with their engines in order to maximize fuel efficiency, it should be said that Toyota has steadily been increasing fuel efficiency of its trusted 5.7 over the years. This brute of an engine is good to tow 10,000 pound too, though that is also bested by most of the competition. 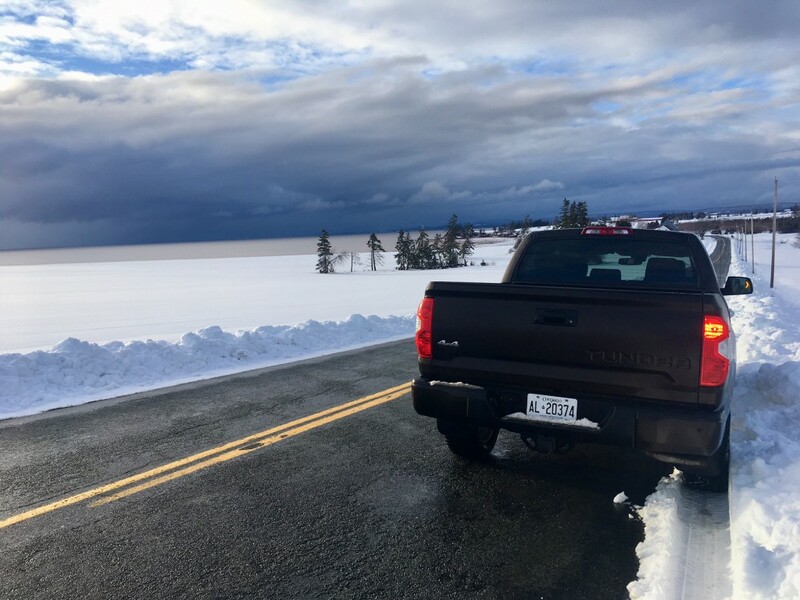 The Tundra drives like an old fashioned pick-up truck and this is where the advantage of not updating comes into play in my mind. The domestic brands have turned truck ownership into a prestigious experience. Some trucks can be decked out pushing the $90K mark. But the Tundra remains a no nonsense truck. It’s the type of truck you don’t worry about taking off road scratching the paint or getting the wheels dirty. 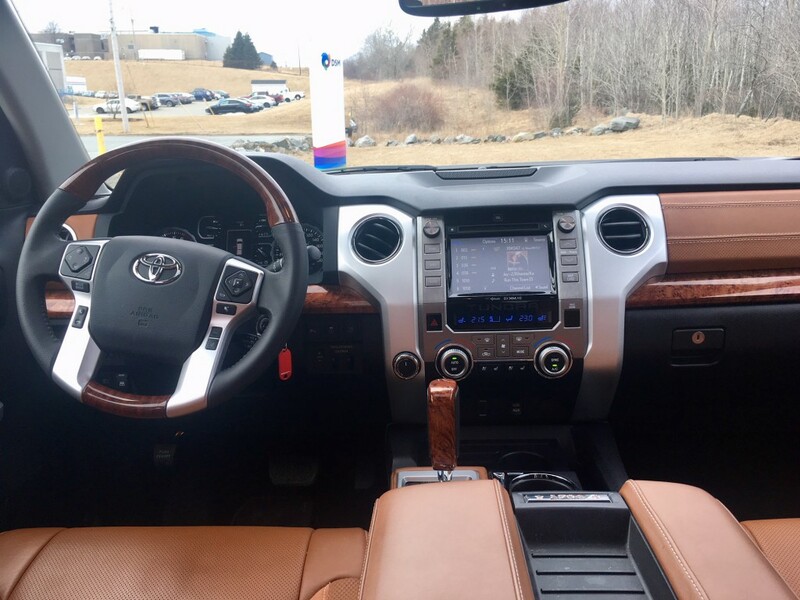 With a fairly high seating position, a wheel that takes about ten years to get from lock to lock and a rugged feeling suspension daring potholes to do their worst, the Tundra feels more like an American truck than a lot of the current American trucks on the market today. That old school feeling makes for simplicity when it comes to truck duties. Need four-wheel drive locked? Turn a dial. Need to get into the bed? Use the bumper or the rear wheel as a step and jump in. Everything is straight forward. This is really what a pick-up truck is meant to be. 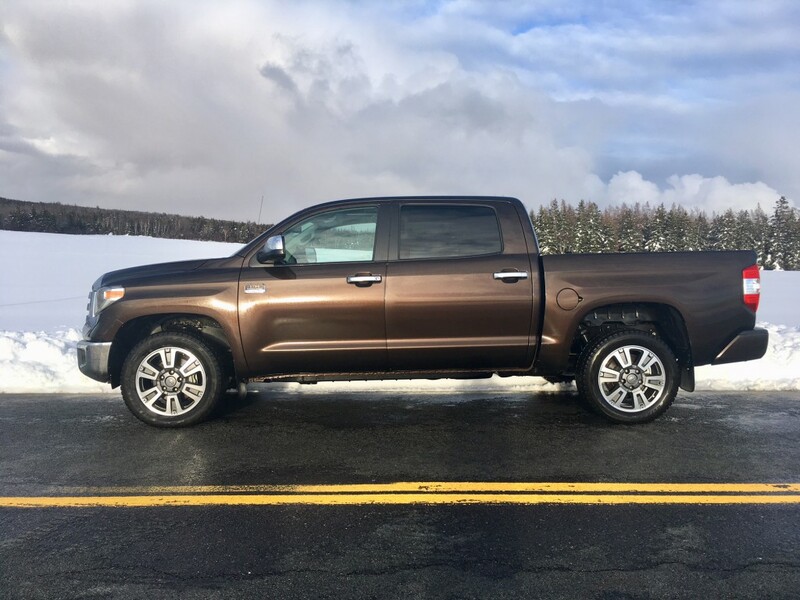 The Tundra doesn’t coddle, it jostles and it is all the better for it. 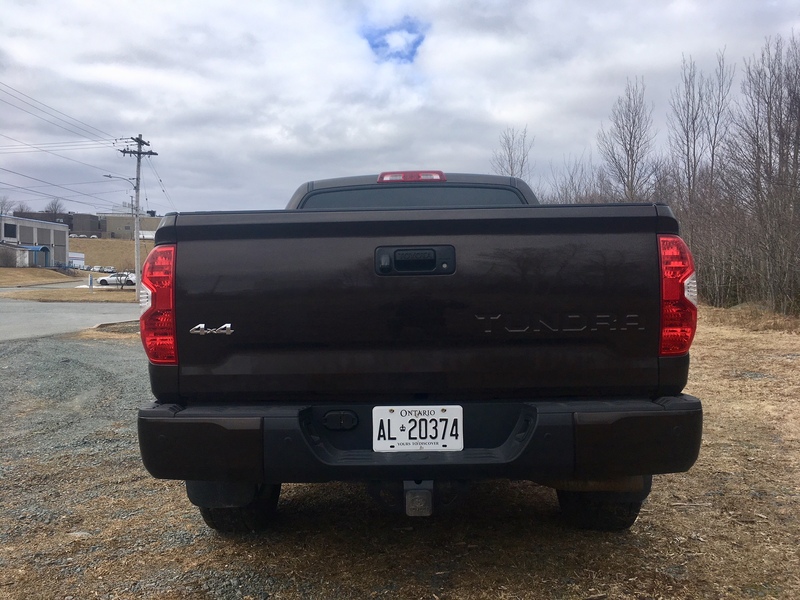 Old-school pick-up feel of course has some drawbacks and when it comes to the Tundra, the biggest is its fuel consumption figures. Officially rated at 18 L/100 kms city and 14.2 highway, my real world mixed city-highway driving returned 16.4 L/100 kms which is a lot. However, this is the third Tundra I’ve tested since its redesign and is so far the best mileage I’ve gotten. The first time I returned 19.2 L/100 kms and the second time I received 16.8 L/100 kms. Still, be prepared for a shock when you are at the pumps. After a week’s driving, the tank was reading half full, yet even at half full it still cost $70 to fill. If you’re looking for a no-nonsense truck that is easy to use and generally gets the job done, the Tundra is a decent option. 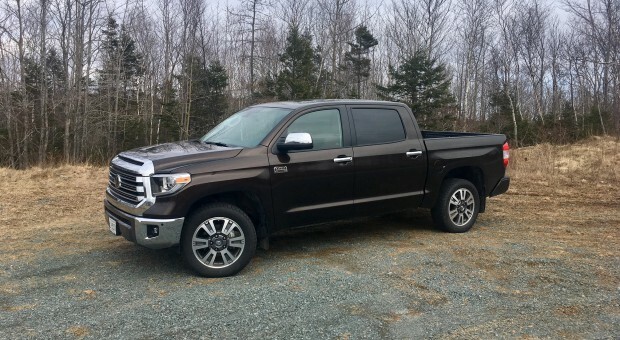 Plus, despite its lack of meaningful updates, Tundras tend to hold their value very well. But if innovative technology, a more plush ride and features befitting of a luxury sedan are more your style, I’d have to say there are better options for you out there.